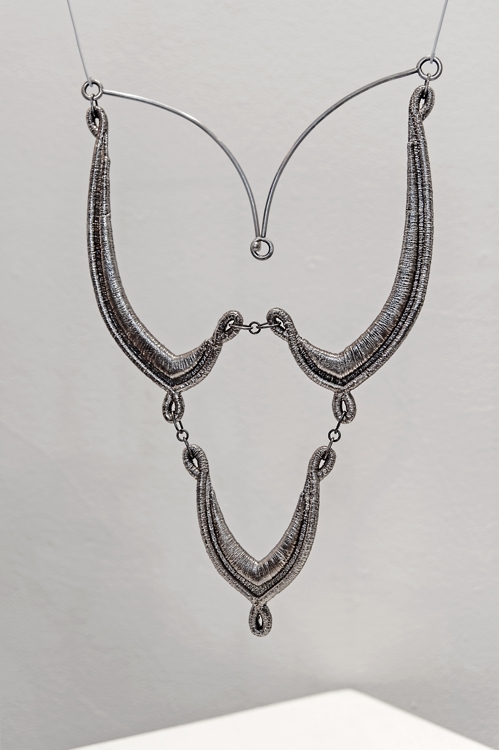 The 13th Annual FRESH Juried Art Exhibition, Akron’s anticipated, contemporary regional art show, opened in January at Summit Artspace with works reacting to a turbulent world. 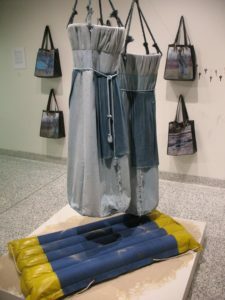 Priscilla Roggenkamp of Alliance took first place with her piercing interpretation of war and displacement with the piece “Refugee,” fabricated of cotton, rafts, keys, tote bags and rope. She is an associate professor of Art at Ashland University. 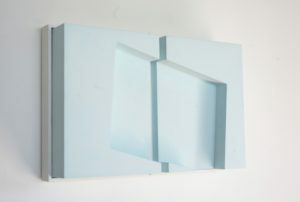 Second place went to Emily Duke of Mogadore for “Double Presence,” an ethereal three-dimensional work that shows division and shadows but whose sky blue surface offers hope. 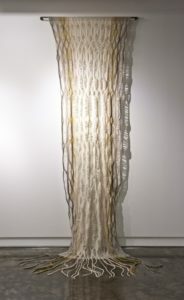 Jasmine Kornel of Cuyahoga Falls was the third place winner for her fiber art work, “Bandage,” described as a waterfall of weaving excellence. The FRESH Air Award went to Erica Bishop of Seven Hills, Ohio, for two works, “River” and “Pond,” both archival pigment prints. 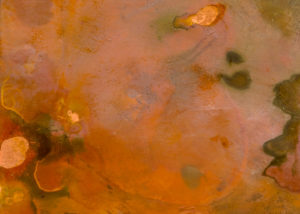 The prints remind the viewer of the fragility and beauty of the environment. Displaying 33 pieces from 29 local artists, the show runs until Feb. 18 at the Summit Artspace Gallery, 140 E. Market St., Akron. With reputation of celebrating new perspectives, FRESH challenges regional artists to take their art in new directions for the annual competition. 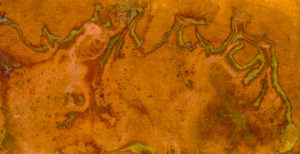 Juror Charles Beneke, professor of Art at The University of Akron Mary Schiller Myers School of Art and associate dean of the Graduate School, selected the works from 71 entries. The works this year vibrate with “a sense of unease and trepidation—our world is unsettled; our political climate is divisive; big changes are impending,” according to Beneke. 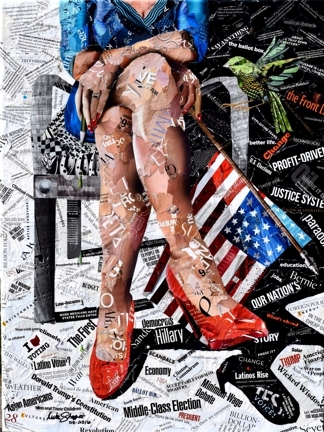 In the selected pieces created in a variety of media and styles, he examined works addressing the recent U.S. election, reflecting upon changes in world cultures as a result of ethnic diasporas and questioning personal identity. 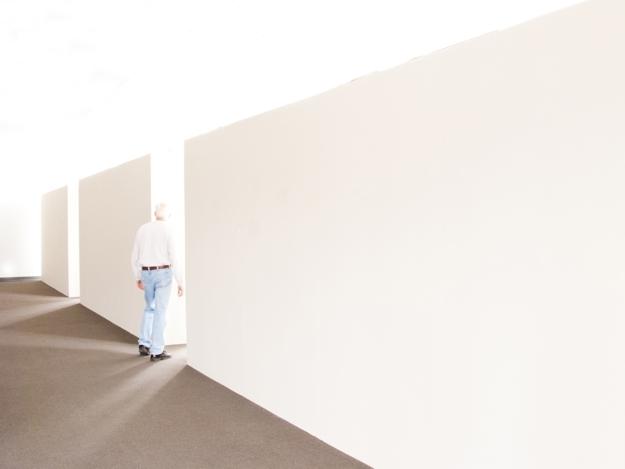 The common theme among the pieces that struck Beneke was the exploration of space. As a nationally and internationally-known visual artist, he observed artists using their craft to ground themselves and come to terms with uncertain times and a new, uncertain world. “FRESH 2017 explores new definitions of space and this new place that we must all learn to navigate and inhabit together,” he articulated. The exhibition is free and open to the public. Gallery hours are Thursdays and Fridays, noon-7 p.m., and Saturdays, noon-5 p.m. The show is open Saturday, Feb. 4, noon-9 p.m. during regular hours and for Artwalk in downtown Akron, which runs 5-10 p.m. Parking is available behind the Summit Artspace building when visiting the gallery. Summit Artspace is handicap accessible and has an elevator. For information about Summit Artspace, go to summitartspace.org or call 330-376-8480. Find Summit Artspace on Facebook, on Twitter at @AkronAreaArts and on Snapchat.